Wheat & Gluten-Free Home Baking by Lola Workman, unfortunately not available on Kindle. This is one of my newest cookbooks, but it is rapidly becoming one of my favourites. I purchased this late last year from Cook The Books, a local cookbook store and a very dangerous place for my wallet. It’s well worth a visit if you’re in to any sort of cooking. Wheat & Gluten-Free Home Baking concentrates on breads and buns and it does these really well. Almost all recipes use the same flour blend which makes preparation super easy, I blend my own and keep a stock of this around, but it’s available pre-blended by mail order from Australia via the author’s website. A few specialty ingredients are used – citric acid and glycerine – but most supermarkets stock these. If you’re going to do a lot of baking I’d advise finding a specialty store and buying in bulk. Some bun recipes also need a Yorkshire tray – like a super-large muffin tray – but as I don’t have one I haven’t tried these yet. As the book is Australian the instructions are for a warm environment and those in a cooler climate will have to move yeast to a warm place to rise instead of leaving it with the mixer. On the plus side the recipes will work with a handheld mixer for the most part, though I use a stand mixer for ease. One caution: Australia uses 20ml tablespoons, which are a teaspoon bigger than the rest of the world where tablespoons are 15ml. Unfortunately the author does not realise that Australia is the odd one out and only mentions that American tablespoons are smaller (American tablespoons are really 14.8 ml, 1⁄2 fl. oz., but close enough for cooking). If you’re not in Australia you must add an additional teaspoon to every tablespoon, Unless you’re in New Zealand and got your measuring spoons from KMart. That will be why your other recipes have problems though. I’ve made a few recipes and so far they’ve worked. I first made Cornish Splits (pictured above) which are sort of half way between a scone and a bun. These result in a non-sticky dough which you cut circles from, unlike most other gluten free doughs. The recipe is unclear though, the last amount of flour should not be worked in, only used to dust a rolling surface, as my first ~food victims~ guests discovered (Sorry!). The breads rely on special gluten free bread tins. These have an extended top to form the bread as it cannot hold its own shape while baking, like this bread pan on Amazon. I haven’t seen these in most general retailers, but specialty shops may carry them. Not using a deep bread tin will result in spillover and a sunken middle as the tension is broken as I found out after trying to bodge together a deep tin out of two shallow ones and some baking paper. The general texture of the bread is good and they slice easily but will tear if roughly handled. 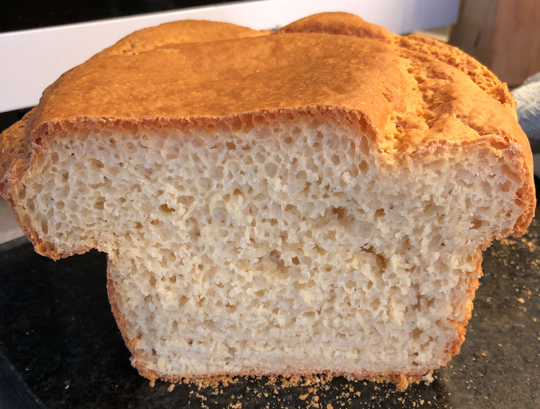 Due to the use of gelatine or agar-agar as a binding agent the loaves do have a more wheat-bread like chew to them than most gluten free breads. Quite impressively I’ve been able to use all the breads I’ve tried for sandwiches. 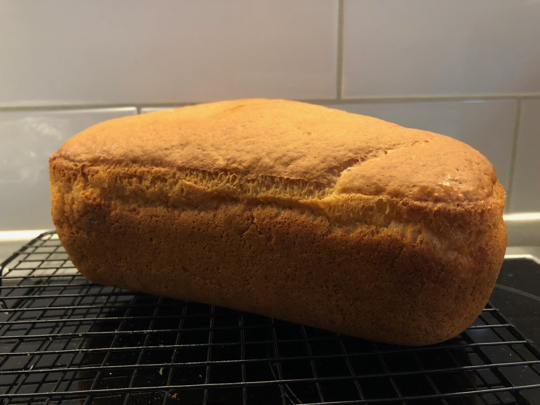 Unfortunately even the dedicated sandwich bread dries out after a couple of days (at least in my environment) and needs heating for a good texture. Several recipes call for a gluten free flour improver sold by the author, but there are instructions in the book for a replacement. There’s also a quite a few uses of glycerine which is unusual in baking, but can be found in the first aid section of your supermarket. Ensure it’s BP100 grade for food use. Interestingly no gums or binders other than gelatine and egg are used, but both are used liberally. It is not possible to adapt these recipes to be vegan. I may experiment with swapping the agar-agar/gelatine with Xanthan and Guar gums, but I suspect this will cause moisture issues. The flour blend by itself seems to be really good. 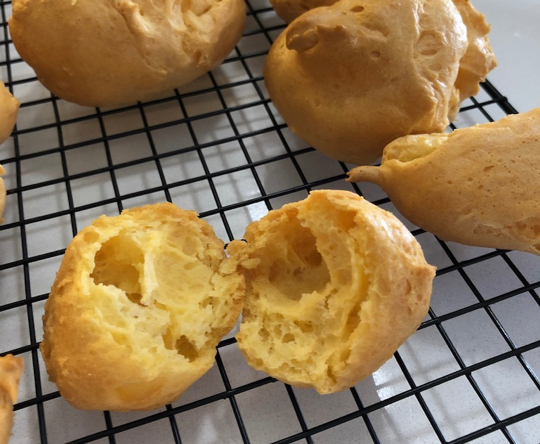 There’s a recipe for a choux pastry – actually for a large choux cheese loaf, but just as easily piped – that has no binders at all other than the egg. The method is the same as a regular choux, just remember to reduce the salt. I’m not great at piping, but I suspect I’ll be attempting more until I can make an éclair. Puffs work OK, but I need to get a larger piping bag first. I would recommend this book to intermediate to advanced bakers. It does not have beginner level instruction and often assumes you know the consistency of the product, but if you’ve made gluten–containing versions before you will quickly pick up these recipes.